An insider frames this week's turmoil with some sad, analagous perspective. 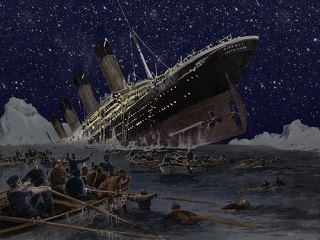 At the beginning of September, the New York Daily News marked the 30th anniversary of the discovery of the wreckage of the Titanic with a slideshow and more. A scant few weeks later, Titanic talk of a different sort frames the newsroom. In the past, the paper’s regular downsizings were referred to as “rearranging the deck chairs on the Titanic.” No more. “It’s now like it has been ripped in two like the Titanic just before it sank,” said one insider. The Daily News was founded in 1919, seven years after the RMS Titanic went down. Along with all the layoffs, there is also, per Kelly, this shocking new signpost: as of this weekend, the print edition of the paper no longer has a Business section. Maybe the most heartless cut of all: Daily News culture critic David Hinckley, who did it all with class and made it look easy. Want to thank my Daily News colleagues for their extraordinary “exit velo” they showed to me in the newsroom today, truly overwhelmed. Axed today at the Daily News. Will miss great politics team, special hugs to @jfermino @erinmdurkin @klnynews @gblainnydn. Onward & upward.